Ah! It’s time to count the cargo that has arrived in the new supply ship. Are your little ones up to the task? 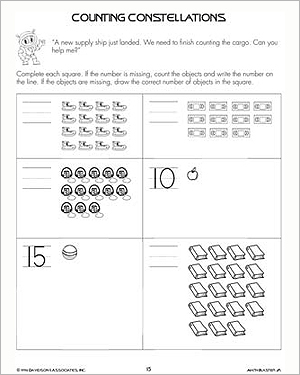 ‘Counting Constellations’ is a fun math worksheet that sharpens the kids’ counting skills. They also get to flaunt their drawing skills in this printable math worksheet. Ensure that the kids have understood the instructions before they get started!